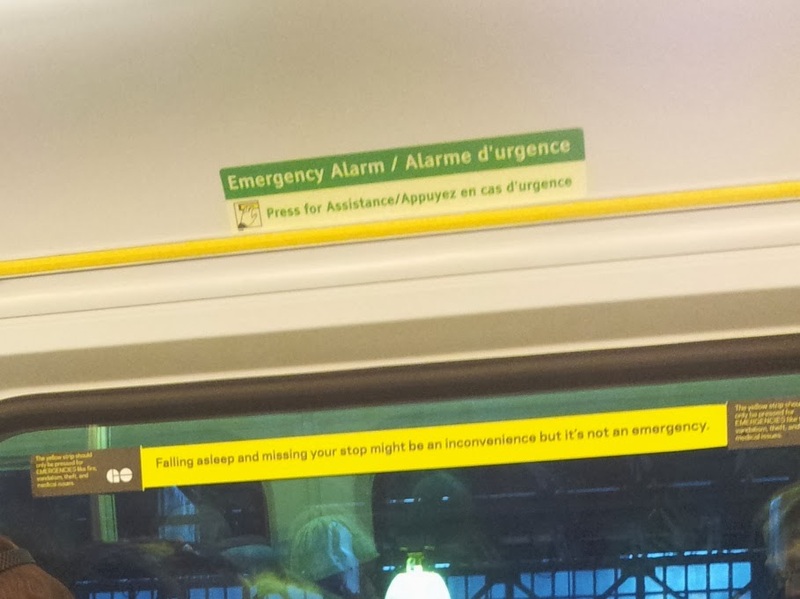 I was on a train a few years back where a woman pulled the emergency brake because she missed the Whitby GO station. We sat for 40 minutes on a stretch of track east of Whitby while the situation was resolved. Prior to her amazing and epic stunt of self-entitlement, our train had already been delayed by door problems at Pickering. She made a whole bunch of life-long friends that night. The yellow strips on GO Transit buses operate as stop requests. Metrolinx remains consistently inconsistent. That is true. They should have asked the manufacturer to color these red. However, people should also try to read once and while. And, anyone who takes the train regularly should know that is not a stop request. If you're a "noob"-ie, I forgive you but if you're a seasoned passenger of GO, you're a jerk if you push it because you fell asleep. I watched this happen a few years ago when I was taking the 5:20 LSE and the guy almost missed the stop at Scarborough, except I think he pressed the red emergency stop button..I might be wrong, anyhow they let him off and gave him a stern talking to and we were stuck on the tracks for 20 minutes, and it ended up costing me $20 in late fees at the day care, was the guy fined? Hope. They need to fine these schmucks. My lady delinquent was not fined either. Your male delinquent should have been forced to pay the fees for all the parents he made late. Metrolinx need to step this up. Well I was heading out one friday westbound when the person missed mimico and pulled the emergency brake. Unfortunately for her, the doors didn't open and she was busily trying to pry them apart when the officers arrived. She was taken away in handcuffs and not to Mimico. we sat for 20 minutes while the train's braking system was re-pressurized. AFAIC, any passenger who pulls those stunts needs to be charged and I'm glad I saw it happen once so far. Did the lady not want to visit the lovely area of Oshawa? Maybe the yellow sign needs to be in large red crayon for them to read.